The new Egyptian president to donate half of both his wealth and salary for Egypt! n one of the biggest graduation ceremonies of the Egyptian Military Academy the president Abd El Fatah EL Sisi has announced his decision to donate half of both his salary and wealth to support Egypt. In a televised speech held during the graduating military students’ commencement ceremony, El-Sisi said he will give up half of his monthly LE42,000 salary to assist Egypt through its economic challenges. he has refused to ratify the 2014-2015 state budget which, in its present form, would raise the total domestic debt to over LE2 trillion, The current domestic debt stands at LE1.7 trillion. He also urged the Egyptians nation inside and outside egypt to embrace real sacrifices for their country and to put aside all kinds of factional demands. El-Sisi was appointed president earlier in June, after securing more than 96 percent of the Egyptians’ vote. He has regularly mentioned that the country’s troubled economy necessitating austerity measures and the rationalization of consumption. Commenting on the controversial Monday court verdicts sentencing three Al Jazeera journalists to 7-10 years in jail, El-Sisi said he will not interfere in the decisions of the judiciary. [blockquote type=”full-width”]There were a lot of discussions about a verdict [on Monday]. I spoke to the minister of justice and agreed that we will not interfere[/blockquote] he affirmed. Monday’s verdict in the Al Jazeera case, which sentenced foreign and Egyptian journalists to jail, drew sharp local and international criticism. England, Australia and the Netherlands each summoned the Egyptian ambassador on their grounds to express concerns regarding the case and the status of freedom of speech in Egypt. The Egyptian foreign ministry, however, said it does not accept interference in its internal affairs. [blockquote type=”full-width”]The judiciary is an independent and honourable institution…if we really want EGYPT to be a state RUN BY institutions, we should refrain from interfering, even if others do not understand the verdicts[/blockquote] El-Sisi said. 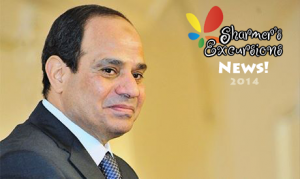 the newly elected Egyptian president Abd el Fatah El Sisi to donate half of his salary and wealth for Egypt!